This pump selection process can optimize lead/lag time. When it comes to pumping systems that have varying demands, many engineers are hesitant to size the pump to less than the highest possible load. While this is certainly conservative from a flow standpoint, the downside is that additional costs are incurred to mitigate what might be a small risk. To assess that risk and make an informed decision, take a Monte Carlo approach, which can save considerable money. The Monte Carlo approach is a statistical method using an aggregation of separate probabilities to determine the resultant probability on the combined behavior. Random combinations of factors result in a consistent distribution curve. In a piping system, this method analyzes the varying system demands in both load and duty cycle. 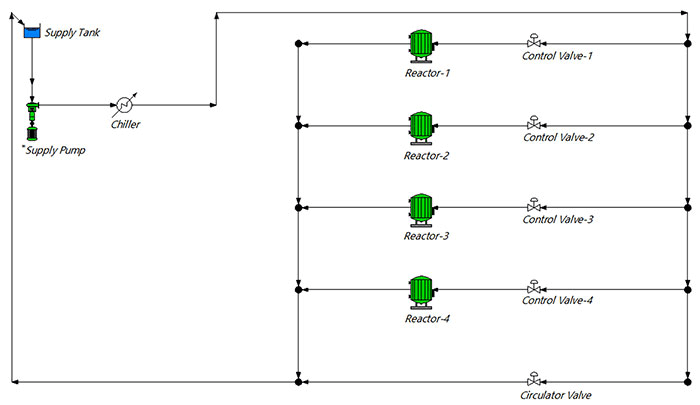 Let us consider a small reverse return cooling water system with four reactors with some variables as shown in Image 1. Each of the four chemical reactors performs a specific function and has a variable range of flows required for each process, product and batch size. Each reactor also has a different percentage of time it is used (see Table 1). For this system, the supply pump meets these needs using a little more than 42 horsepower (hp) at 74 percent efficiency and is operating close to best efficiency point (BEP). Applying a Monte Carlo analysis, we can see the percentage of time the system demands a particular flow rate (see Image 2). 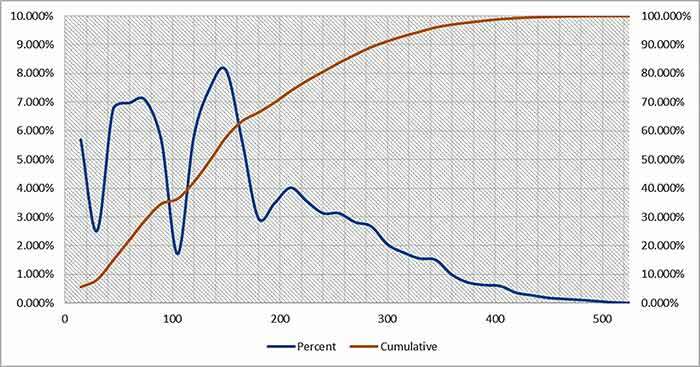 Looking at the cumulative curve, we can see that 90 percent of the time, the system requires 290 gpm or less, which is a little more than half the maximum amount. If we want to minimize unproductive bypass flow and power consumption while maximizing efficiency, this information points us to some options. Coupling a 290 gpm, variable frequency drive (VFD)-driven pump in parallel with a constant speed 250 gpm pump in parallel when demand was greater than 290 gpm would improve VFD efficiency. It would spend more time in the higher efficiency, higher percent of full speed range of the VFD. The single pump design would operate at 56 percent of synch speed or less for 90 percent of the time. Allow the constant speed pump to be sized at its BEP and save installation and maintenance costs by not requiring a second VFD and reducing the amount of wear on the VFD-driven motor. Another option is to use two smaller, 100 gpm pumps to handle 30/70 percent of the load in a lead/lag configuration, and a larger pump to handle the occasional higher loads. Savings for each option should be compared to help engineers decide. Editor's note: Joseph Benefield is a member of Ray Hardee’s team at Engineered Software Inc.
Ray Hardee is a principal founder of Engineered Software, creators of PIPE-FLO and PUMP-FLO software. At Engineered Software, he helped develop two training courses and teaches these courses internationally. He may be reached at sales@eng-software.com.